When it comes to NHL free agency, many fans make their own “wish lists” of free agents they want their favorite team to sign. However, NHL teams are limited in their ability to spend due to the salary cap. 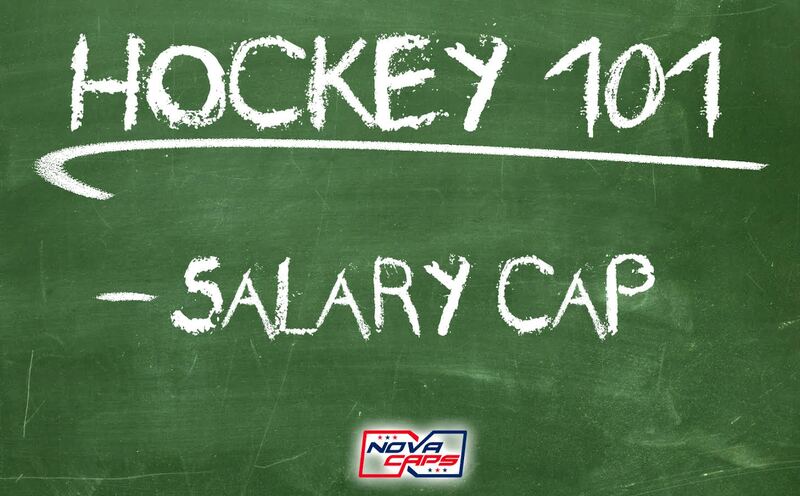 In this guide, NoVa Caps gives an in-depth explanation of the ins and outs of the salary cap and how it works. In the very early days of the NHL, the league had a salary cap of $62,500 (and $7,000 per player) particularly during the Great Depression due to the financial crisis the United States was in. This forced teams to trade away big-name players. The current version of the salary cap was implemented beginning in the 2005-06 season (the season after the 2004-05 lockout) and was instituted to limit teams’ spending and budget. The starting cap ceiling was $39 million. The maximum cap for players was $7.8 million (which was 20% of the team’s cap. The cap is calculated as a percentage of the league’s total revenue from the prior season. Unlike other sports, NHL teams cannot renegotiate (or restructure) a player’s contract. This includes changing the player’s salary. The only way a team can rid itself of a large, handicapping contract is either to trade the player or buy out the player. If a player signs a player 35-years old or older, that player’s salary will not count against the cap until the second year of a contract (if it is a multi-year contract), and will continue regardless of whether or not the player is still on the active roster. Placing a player on long-term injured reserve (LTIR) gives the team some salary relief. A buyout of a player’s contract counts against the salary cap, but only the buyout portion counts. A cap hit is the total amount of money a player makes each year of his contract. It is determined by dividing the length of the contract from the total amount of the deal. This is to prevent teams from paying the player different amounts a year. Performance bonuses count towards the salary cap and there is a limit amount teams are allowed to pass the cap ceiling in order to pay bonuses. The acquiring team must assume at least 50 percent of the remaining salary and cap charge of the SPC. Such a contract can only be traded twice using provision 1 during the lifetime of the SPC. Retained salary by the trading team cannot be more than 15 percent of the upper salary cap limit. A maximum of 3 such contracts with salary retained in a trade can be on a team’s books at any one time. This provision is included in the 2013 Collective Bargaining Agreement (CBA MOU). The difference between a team’s actual total of salaries and the salary cap is called cap room. This is the amount of money a team has available to spend on player contracts. This is the reason some teams are unable to adequately spend in free agency. The cap ceiling is the maximum amount of money a team can spend on player salaries. If a team exceeds it, they will be required to fix their situation. The cap floor is the minimum amount a team MUST spend on player salaries. This entry was posted in News, Salary Cap and tagged Michael Fleetwood, Salary Cap. Bookmark the permalink.